The bigger your business, the further your decision-making is from your customer. And the less able you are to make the best, most relevant and most commercial decisions. Most small businesses look to emulate big company strategies to become more professional. Gaining inspiration from independent businesses is one way that big brands can overcome challenges and improve customer satisfaction and increase their competitiveness. Small businesses learn directly from their customers. Across any industry, business owners who are in direct contact with their customers will instinctively ask questions and identify their needs much better than any customer survey or market research. This direct connection provides accurate information and allows the business to make relevant product and service decisions that bring about better customer satisfaction. 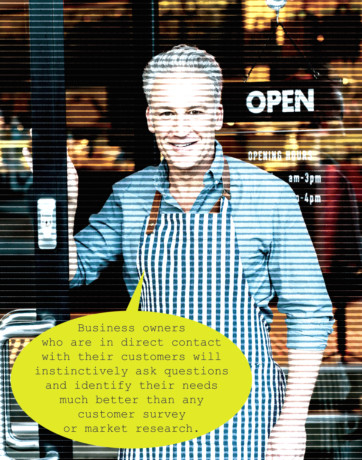 The more staff involved in feeding information back up from customers, the more likely the feedback will be interpreted, translated and distorted. As a senior executive, you can get too absorbed in the major deals and lose your grass-roots instincts. Get back to the shop floor, attend sales visits by junior sales managers, read the comments on social media channels, and dedicate — regular — but limited time to stay involved with your grass roots staff. Not only will this boost staff motivation and sense of worth, it will also benefit your gut feel and help you make better instinctive decisions. Small businesses are open and curious to try and test new things. They take customer feedback and change something that enables them to discover new ways. They are not bound by the same chains that large companies have in reporting lines, policies and approvals. This enables them to give more things a go and find new opportunities that at a large organisation wouldn’t even appear on their radar. From the busy little coffee shop in an out-of-mall location to a packing and moving business, successful small companies can immediately test a new idea with the next customer and instantly find a way to improve their offering. Bring in a creative approach to customer service and allow the staff to be experimental in how they do their jobs. Reward new ideas and use them to improve service deliverables. If you cannot trust your staff, then you need to improve the training. Provide them with appropriate guidelines to bring their personality and strengths into how they sell and serve. When a strategy isn’t working, a small-business owner will quickly change direction. Not only do they monitor their business much more closely, they are fast to change. Big business jargon calls this “agility”. A small-business owner will tell you they cannot afford not to be responsive. They are fast and reactive to both threats and opportunities. They attend to earlier indications of warning signs and take control where possible. In comparison, large companies will suffer wrong new hires well past probation deadlines, can be slower and indirect about performance feedback, and more likely to allow the team to compensate for low performers. The smaller a business is, the leaner it is. Address warning indicators immediately and never wait to see what happens. Improve your monitoring and control mechanisms to address areas of under-performance, and bring in structure and clarity to improve your management precision. Above all, an owner-manager of a business tends to be, by nature, a non-conformist. They are active with promoting their business in networks and with peers, open to new ideas and collaborations and are often humble in their approach to customer service. Having no idea how to benchmark themselves, a typical small business owner will believe they have no competition and just focus on delivering the best result with every customer interaction. Not concerning themselves with other businesses, they can focus on customer satisfaction without distraction. This actually reflects a true and healthy competitive landscape by offering customers more benefits, more uniqueness and more choice. Too often big companies fight each other on the same, conventional offering rather than develop something original that brings creativity to the industry. If you are directed at your competitor as a rival brand rather than at your customer to broaden their choice, then you can learn a lot from the direction and determination that a small business has on customer needs. Introduce ideas to bring newness to your industry rather than battle on the same familiar ground. In every market, there are the Davids and the Goliaths. Adopting successful strategies from the small businesses will help you bring fresh ideas to keep you competitive and vigilant to new trends. Focus on your differentiating aspects, but also be alert never to dismiss a new way of doing things, however, unconventional it might seem or unlikely it being successful. Rania Laing is founder and business consultant at Your Neuro Coach and a board director at the International Coach Federation, UAE Chapter.